The City of Spokane would like to thank all the individuals, businesses and organizations for their assistance in helping make the City of Spokane an official Preserve America Community in 2005. Preserve America is a White House initiative that encourages and supports community efforts to preserve and enjoy our priceless cultural and natural heritage. 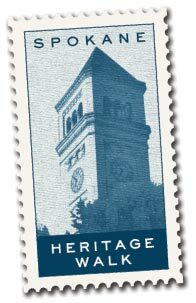 With Preserve America designation, the City of Spokane sought to strengthen the public-private partnership between local government, businesses, civic associations, and non-profit organizations in the interest of preserving Spokane's historic and cultural heritage. In December 2005, the City-County of Spokane Historic Preservation Office applied for and received a $20,000 Preserve America Grant from the National Park Service. The grant was awarded in March 2006 for a new marketing campaign, a focused heritage tourism program to promote Spokane's downtown historic resources and historic districts. The objective was to provide recognizable and consistent materials and online resources designed for Spokane's increasing number of visitors and local residents. Over the last two years, the City of Spokane's Historic Preservation Office, forming a new public-private partnership, worked in conjunction with the Northwest Museum of Arts & Culture (MAC), the Downtown Spokane Partnership (DSP), and the Convention and Visitors Bureau (CVB) to create the city's first downtown walking tour brochure and associated interactive website, Downtown Spokane Heritage Walk: A Self-Guided Tour of Downtown Spokane's Historic Places (PDF). This material is based upon work assisted by a grant from the Department of the Interior, National Park Service. Any opinions, findings, and conclusions or recommendations expressed in this material are those of the author(s) and do not necessarily reflect the view of the Department of the Interior.